A tough workout can test your limits. But push it too hard on that final set of jumbo squats and uphill sprints, and instead of feeling an endorphin rush afterward, you might experience the opposite—a serious energy crash. It’s a type of exhaustion that’s hard to bounce back from, and is increasingly evident among—especially those now atoning for holiday indulgences. But there’s a fine line between training and overtraining. In this season of #goals, however, it can be hard to strike that right balance, and after a season of late-night parties and little time for sleep, your body might already be compromised. The solution is not to call it quits, though. Instead, it’s about tweaking your training so you can maximize your muscle burn but still power through the new year. 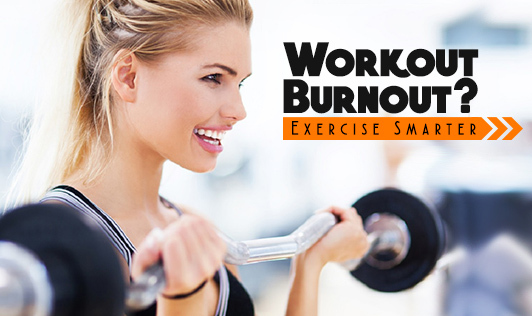 Our experts share seven tips for preventing workout burnout. You shouldn’t do high-intensity workouts every day. Not only will you be fatigued, but you also won’t get the results you want from those classes. If you are doing a boot camp workout seven days a week, for example, can you sprint at your fastest pace or do your reps properly? And if not, what’s the point in that? Instead aim for balance. Make 25 percent of your weekly workouts intense and the other 75 more moderate. Be explosive for shorter bursts. A 20 minutes of HIIT gives you more energy than a 10 kilometer run. It’s all about how high your heart rate gets, rather than the mode of activity. Ramping it up for longer than 20 minutes can lead to diminishing returns—meaning you’re wiping yourself out more than increasing your overall fitness level. Whether you’re a fitness junkie or training for a competition, your workout plan should include active recovery days. And you don’t just say you’re going to go easy on those days—you really do. Some good options: restorative yoga that stimulates and relaxes your muscles, a light swim, or a dynamic stretch class. Clocking workouts later in the day, when you’ve already been running around for hours, can drain your last bit of energy so that you’re in deficit mode for the rest of the evening Try to save those all-out sessions for earlier in the morning or weekends. Split up your training. Rather than doing one ultra-intense 10-kms run, for example, go for two 5-kms jaunts over the weekend so you have the stamina to pull through the weekend. Decode what your body says. Avoiding exhaustion really comes down to listening to your body. Instead of putting on your earbuds and tuning out at the gym or on the dirt path, stay focused on your breathing and your pace—once you develop a training routine, you’ll start to pick up on the signals that you’re hitting the wall. The better you know your body, the easier it will be to sense when you should stick it out or scale back. After a good workout, you have to keep moving. You can’t go full throttle and then be inactive. You need to walk around or stand for at least a few minutes to keep the blood flowing. This way, your body doesn’t need to recruit extra energy to recover, and you’ll help prevent lactic acid buildup that can lead to stiff, sore muscles. Dehydration is what can really zap your energy later on, so staying hydrated is really important. Post workout reach for protein-rich food sources, like a green smoothie, yogurt, fruits, or egg whites to help your body rebound. There’s only so much you can digest. As with everything, let this be your mantra: moderation.